It has been a bad first week in December 2016 for Singtel. It has encountered the unprecedented outage on their Broadband services islandwide since Saturday morning. Thankfully, at 08:25am this morning (Sunday), they have restored 100% of their Singtel fibre broadband services. It took them approximately 24 hours to resolve the issue. It is unprecedented because Singtel could not quickly identify the root cause, it happened on a Saturday morning and services were affected islandwide. Previously, in 2013, they had a fire at Bukit Panjang Exchange and causes outage that lasted 9 days but not all were affected. Nevertheless, Singtel was fined S$6 million for it. So, did Singtel handle it well this time? I believe so. Given that they are updating via Facebook on the status (almost regularly) and at the same time, dished out compensation for their customers, I believe they are doing their best. However, nothing can satisfy an angry customer. The negativity over at Singtel Facebook page will take weeks if not months to clear. First announcement of the outage from Singtel at 09:43am. Problem started from 08:45am. A total of 9 updates provided by Singtel over the 24 hours. Over 35k of comments over this Facebook post and most of them are negative comments. Almost 8k of share on the Facebook post. Some suspected DDoS attack but Singtel did responded that it is not and was due to the fact that they could not assign IP addresses for their subscriber. It may sound easy but it is difficult to understand why it couldn’t. Some customers thought that some hardware had failed. It is not that simple. If there are multiple hardware failures, I believe they have redundancy plan to overcome them. Some customers thought that it is on purpose that Singtel ended their 1688 call after some basic announcement. I believe that this is a standard countermeasure for such high volume of calls. Some customers wanted compensation for their mobile data plan. However, they are on other network other than Singtel. I don’t think Singtel can help. 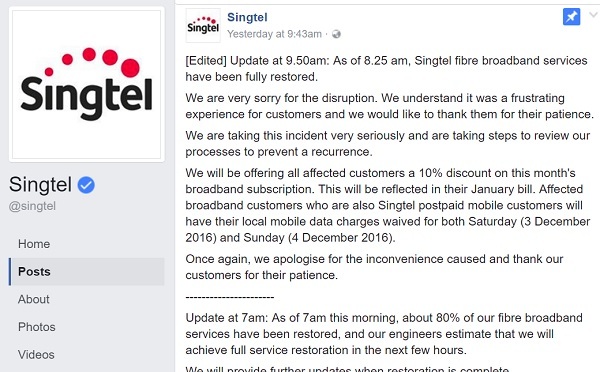 Some customers could not connect to Internet even though Singtel officially announced that they have fully recovered this morning. I believe that a reset on their broadband equipment will do the trick. All-in-all, as a Singtel customer, I am equally frustrated over this incident. However, please let them investigate the root cause and announce it over their official channel. Here are their “goodwill” compensation for this incident (based on their Facebook announcement). All affected customers will get a 10% discount on this month’s broadband subscription. This will be reflected in their January bill. Affected broadband customers who are also Singtel postpaid mobile customers will have their local mobile data charges waived for both Saturday (3 December 2016) and Sunday (4 December 2016). Two groups of customers will have their mobile data waived. Overall, I just want to say that not all people have Facebook account to read the updates. It is frustrating to see updates but no estimated progress or estimated time to resolve the issue. There is also no other announcement elsewhere. Many requested SMSes update as a form of evidence for the outage and also on the compensation plan. I think that it might not be a bad idea since Singtel can easily waive off this SMS charge (if any) and let customer have a peace of mind to use their mobile data for surfing or connecting to Internet. That are my views. What is yours?